Delayed onset muscle soreness [DOMS] is a common painful condition that arises from exercise-induced muscle damage after unaccustomed physical activities, including intentional exercise. DOMS can happen after yardwork, snow shoveling, strenuous physical work, muscle strengthening and gym workouts. Whiplash from a motor vehicle accident can be very similar. Various treatments have been used to reduce this, including ice packs, persistent pressure, electrical stimulation, stretching, massage and medications. In a review of 35 studies, massage proved only slightly effective in the relief of symptoms and signs of exercise-induced muscle damage. Therefore, its benefit was too small to be practical. There was a lack of evidence to support the use of cryotherapy, stretching and low-intensity exercise, but there is research to support using pulsed electromagnetic fields therapy to help support muscle soreness. As a result, a randomized, double-blind, placebo-controlled study was done to examine the effects of a 7000 Gauss PEMF, applied for 15 minutes daily for three days, to the biceps muscle. 30 healthy volunteers had repeated iso-kinetic exercise of the biceps at low and fast speeds. The PEMF was applied after the exercise and objective and subjective measurements were made of muscle function and symptoms. 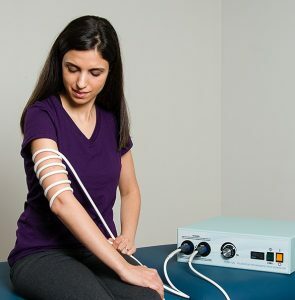 Overall, PEMF stimulation was more effective than sham in reducing symptoms, including perceived soreness, and and in improving electrical function tests of the muscles. Muscle strength [peak torque] recovered to pre-exercise levels earlier than the sham group. 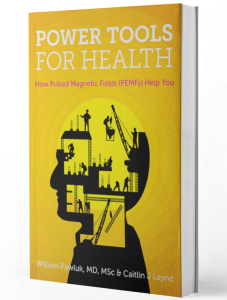 In this study a relatively high intensity PEMF signal was used to obtain the benefits seen. I’ve had personal experience using lower intensity PEMFs after yardwork right after exercise that would normally induce muscle soreness, before the muscle soreness began. I’ve also had benefits when I did the therapy the morning after when the muscle soreness was already established. In this study, a small PEMF applicator was applied to the muscle that was exercised. In the case of yardwork or other exercises involving many muscles, a larger PEMF pad should be used or a higher intensity whole body PEMF system. It may also be possible to prevent muscle soreness by using a portable PEMF system over specific muscles while exercising or immediately afterwards. In addition, PEMFs applied to muscles before exercise will increase ATP production and circulation to the muscles to potentially not only increase the peak torque of the muscle but also reduce the likelihood of development of post exercise soreness. Effects of pulsed electromagnetic field therapy on delayed-onset muscle soreness in biceps brachii. Jeon HS, Kang SY, Park JH, Lee HS. Phys Ther Sport. 2015 Feb;16(1):34-9.